Above: “We’re not holding people accountable,” Neill Franklin, former head of training for the Baltimore Police Department, said outside the courthouse. 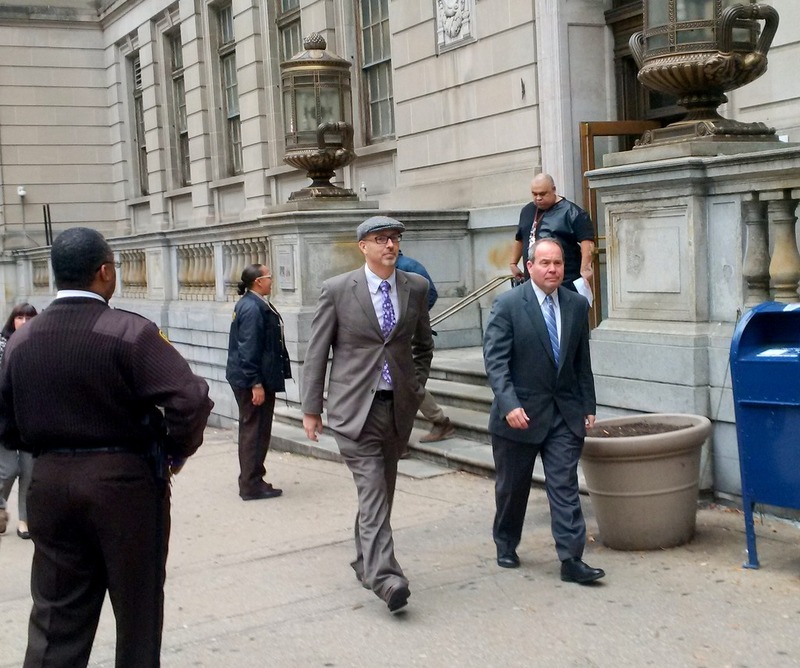 Advocates for the reform of policing practices weren’t waiting for a verdict in the William Porter case yesterday, but used the trial of the first officer charged in Freddie Gray’s death as a teachable moment for Baltimore and the nation. “The defense case last week featured disturbing testimony from senior Baltimore Police commanders,” the American Civil Liberties Union of Maryland said in a media release, as the case went to the jury. Topping their list was the testimony by former Baltimore Police Colonel Timothy Longo, who said it was reasonable for Officer Porter to fear Gray, “whose legs were shackled, whose hands were cuffed behind his back and who had not attacked or threatened Porter,” the ACLU said. Longo had said it was “objectively reasonable” for Porter to ignore the Police Department’s general orders requiring detainees to be put in a seatbelt in a transport van. Gray died in police custody due to injuries prosecutors say he suffered while riding, unbuckled, in a police transport van. “If this is the testimony of BPD officials – a police department governed not by rules, but the whims and implicit bias of officers – then we really shouldn’t trust the police to investigate themselves and claim that the system will take care of the ‘few bad apples,’” the ACLU said. 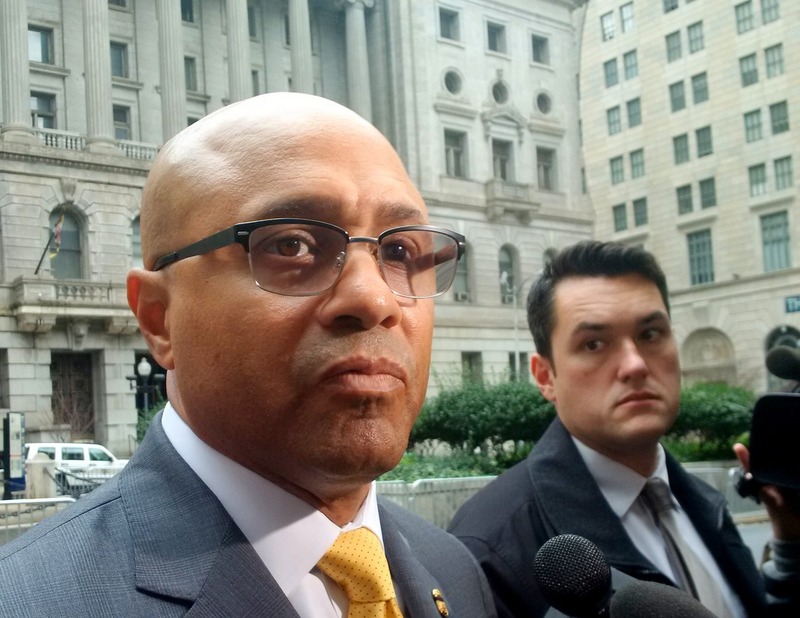 Likewise Neill Franklin, a former head of training for the Baltimore Police Department and the Maryland State Police, stood outside the courthouse and told a gaggle of media that the case highlighted an urgent need for reform. “We need to understand the importance of protecting the people we put in handcuffs – not just ‘the good people,’ but everyone,” said Franklin, executive director of Law Enforcement Against Prohibition (LEAP). Meanwhile, taking another point of view and commanding his own gaggle of reporters, was defense attorney Warren A. Brown, who said Porter could not be faulted for failing to call a medic when Gray told him he couldn’t breathe. Halfway up the block, Franklin made the opposite argument. “It’s not just the job of a sergeant, a lieutenant, a major. It’s also the responsibility of any officer to hold people accountable for what they’re doing or not doing,” he said. The legal question of what could be expected of “a reasonable police officer” is at the center of the case prosecutors brought against the 26-year-old rookie officer. Following his April 12 arrest, Gray died of a broken neck and nearly severed spinal cord. During her passionate closing, Deputy State’s Attorney Janice Bledsoe held up a bloody seatbelt and asked the jury how long it would have taken to click the seatbelt on or call for a medic. Bledsoe said Porter failed on numerous occasions to prevent Gray’s death, including not calling a medic when Gray said he couldn’t breathe. “Officer Porter, who had great power, had opportunities on five occasions to save Freddie Gray, who had no power,” said Bledsoe, whose voice at times rang out strongly. 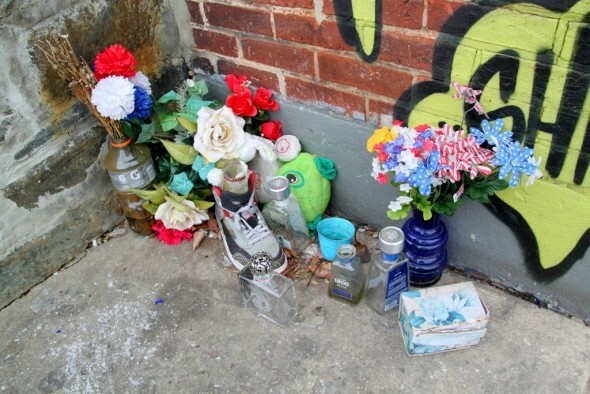 When “that van door closed on Freddie Gray, that wagon became his casket on wheels,” Bledsoe told the jury. “I’m begging you not to be swayed,” said Murtha, who otherwise was sparing with the rhetorical flourishes. Murtha reminded jurors that two defense witnesses said it was common practice for officers to use their discretion, depart from the rules and leave detainees in police vans unbelted. The case went to the jury of seven women and five men, who began their deliberations at about 2:30 p.m. yesterday and were sent home at about 6 p.m.